The new edition of this popular North Carolina prelicensing textbook combines solid industry fundamentals with the latest state-specific information to prepare students for North Carolina’s AMP licensing exam. The text includes an appendix of all critical forms and contracts, an expanded license law discussion, the latest financial information pertaining to the secondary market, short sales, predatory lending, foreclosures, mortgage legislation, North Carolina anti-fraud laws, and more. 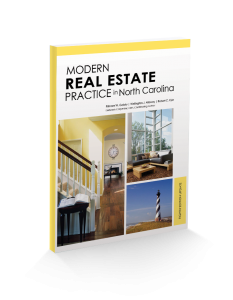 Modern Real Estate Practice in North Carolina has set the standard for prelicensing education in the state. This book will fully prepare your students for success on their exam, and in their career.